The 2018 Festival Committee has formed a partnership with the Lyft Corporation. Lyft is going to offer a 25% discount to anyone who uses the ride share company to get to or from the 2018 Italian Festival. 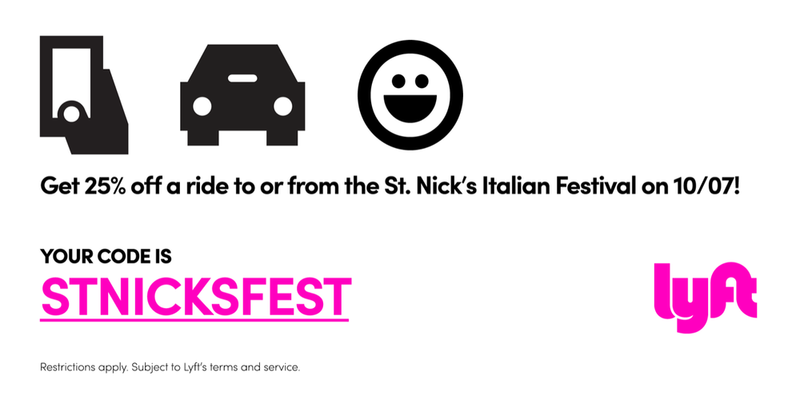 When ordering a Lyft for the Festival use the code: STNICKSFEST to receive the 25% discount on your fair. Also when ordering a Lyft please use the address of 900 Tasker Street for pick up and/or drop off to help alleviate traffic flow through the festival area.